Ever heard of the expression “cool as a cucumber”? Cucumbers are a great ingredient for summer dishes. Highly hydrating and incredibly versatile, they have made their way into just about every summer recipe imaginable. Wash, peel and de-seed (if needed) a whole cucumber and pop it into a blender or juicer. Extract the juice and pour into a jug. To this, add some lemon zest, about 1/2 a cup of lemon juice, 6 cups of water and sugar to taste. Chill before serving. Great for kids as-is, or give it a dash of vodka for grown-ups. Serves 6. No summer can be complete without a little watermelon action. 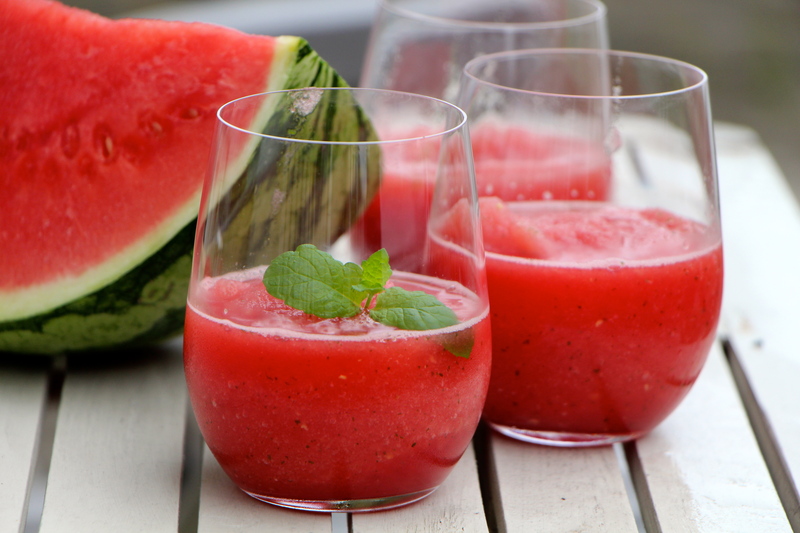 This drink combines the benefits of a summer cooler with the amazing flavour of the humble watermelon. Grab some watermelon, and juice enough for a jug. Add the juice of 2-3 limes depending on the size, tasting as you go along. Throw in some ice cubes and a little sugar or sweetener if needed. For a touch of excitement, swap out a third of the watermelon juice for something fizzy. Sparkling or tonic water works well. And if you need to (who wouldn’t? ), spike things up with a touch of gin or vodka! Yum! The pineapple is another staple summer fruit, they’re tangy, refreshing and full of sunlight energy. Mix this drink up for a snazzy afternoon pick-me-up. This one is sooooo easy, you could make it in your sleep! Take a 1/3 cup of pineapple juice and add 1/4 grapefruit juice. Bruise 2-3 fresh mint leaves, crush a few ice cubes and add to the juice. Top up with a little gin and enjoy! Melons of all types are great for summer in general because of their cooling juiciness. For this drink, honeydew or cantaloupe works equally well. They’re sweet, refreshing and thirst-quenching. Thickly slice some melon and blend until you get a nice consistency. You’re looking for a smoothie-like finish. Add a little water if it gets too thick. 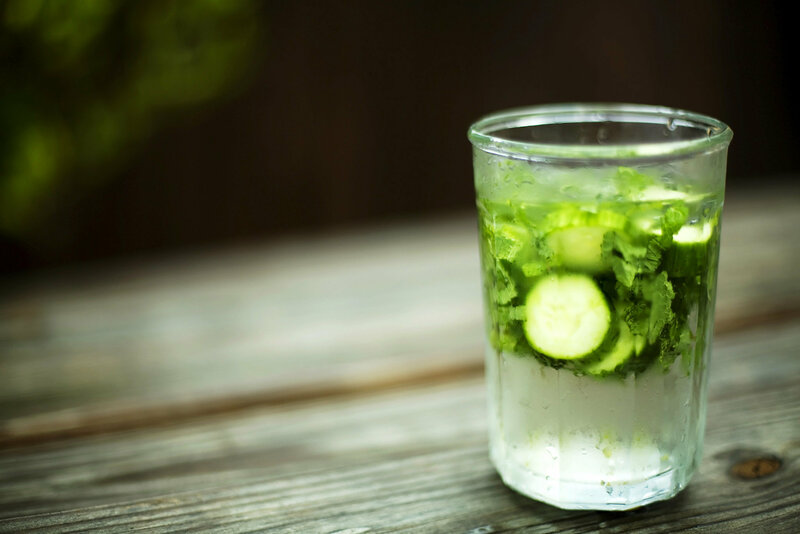 Pop in a little sugar or honey to taste, introduce a touch of lemon or lime juice and lay on a mint leaf. Stick it in the fridge until needed. We really don’t need to mention that sparkling wine, vodka or a little Cointreau make great finishing touches. Ginger is an oft neglected summer ingredient. Add a little ground ginger to meals to pep up your appetite on really hot, sticky days or take a few finely chopped strands to relieve a bloated, BBQ-laden stomach. Ginger offers a fantastic flavour kick and, contrary to popular sentiment, is perfect for a summer drink.